Chicken mami is actually chicken noodle soup which became popular in the Philippines because of the Chinese immigrant named Ma Mon Luk. Chicken mami is one of the varieties of mami soup invented by Ma Mon Luk and other consists of pork, beef, wontons and pig innards. 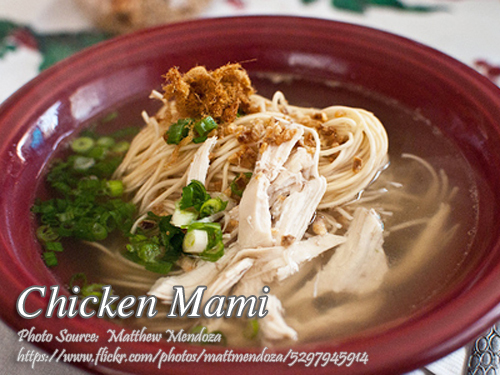 There are also varieties of chicken mami and you can also include vegetables like shredded pechay baguio. To cook the chicken mami; Add chopped onions to chicken broth, season with salt and MSG. Then bring to a boil. Place noodle in a deep bowl. Top with flaked chicken meat, fried garlic, and egg strips. Pour in hot chicken broth and sprinkle chopped spring onions on top. Serve hot. To make a special mami, add 1 piece unbeaten raw egg on top of your hot mami before serving. To see the rest of the recipe with the exact measurement of ingredients, continue reading. Add chopped onions to chicken broth, season with salt and MSG. Then bring to a boil. Place noodle in a deep bowl. Top with flaked chicken meat, fried garlic, and egg strips. Pour in hot chicken broth and sprinkle chopped spring onions on top. Serve hot. To make a special mami, add 1 piece unbeaten raw egg on top of your hot mami before serving.